(1576, Ipswich, England-November 1633, Rotterdam, Holland) Education: A.B., Christ's College, Cambridge, 1597. Career: teacher at Christ's College, c. 1597-1610; controversialist in Holland, 1610s; Professor of Theology, Franeker, Holland, 1622-33. William Ames lived the tumultuous sort of life that sent many Puritans to New England, and if he had lived longer he might have gone himself. Although Ames did not migrate, he bequeathed the Congregationalists his textbook, his library-and, in a sense, his family. Ames studied at Cambridge under William Perkins, the great exemplar of moderate Puritanism. Ames might have become master of Christ College, except that he became more open in his support of Puritanism after the death of his mentor. He refused to wear a surplice in -college chapel and attacked card playing. These typically Puritan stands won him suspension by the university. Ames hoped to settle as minister in Colchester, but was forbidden to preach by the Bishop of London. He then went to Holland, like so many other early Puritans; he was supported by some London merchants, who wanted him to take part in current debates between Calvinists and Arminians. He was a skillful advocate for Calvinism at a time when Arminianism was growing popular in the Anglican Church and on the continent. And he became one of the leading theologians of his time. His book, Medulla Theologiae, was the standard survey of theology used by several generations of New England students. Congregationalists were also influenced by his insistence that speculative divinity was less important in the pulpit than a good sense of the "use" of each doctrine. His De Conscientia applies Christian moral principles to particular circumstances. Even in Holland English authorities were able to block Ames's appointment to several attractive positions. 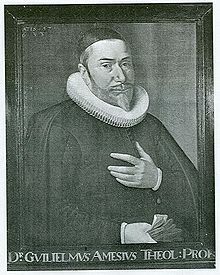 Finally he became professor of theology and university president at Franeker, where he served for a decade, attracting students from as far away as Hungary, Poland, and Russia. He had considered going to New England, and after his death in 1633 his widow and two children immigrated, taking with them his library-a valuable asset to the Puritans in the wilderness and a tangible link to a man who would influence Congregational thought for years to come. A: The Marrow of Sacred Divinity (London, 1643); An Analytical Exposition of Both the Epistles of the Apostle Peter (London, 1641); The Substance of Christian Religion (London, 1659); The Workes of the Reverend and Faithfull Minister of Christ William Ames (London, 1643). B: DNB, 355-57; Keith L. Sprunger, The Learned Dr. William Ames (Urbana, Illinois, 1972).